Glastonbury is without doubt one of the biggest and best music festivals in the world. With so much going on over the three days, the stages are graced with some of the most influential bands and artists of all time. It is no wonder the Pyramid Stage is now an iconic image. The vast site is nothing short of a town and there is so much to do, visitors could stay there for a week or two to take it all in. Shangrilla comes alive at night and at bedtime, Shangrilla is just getting started! 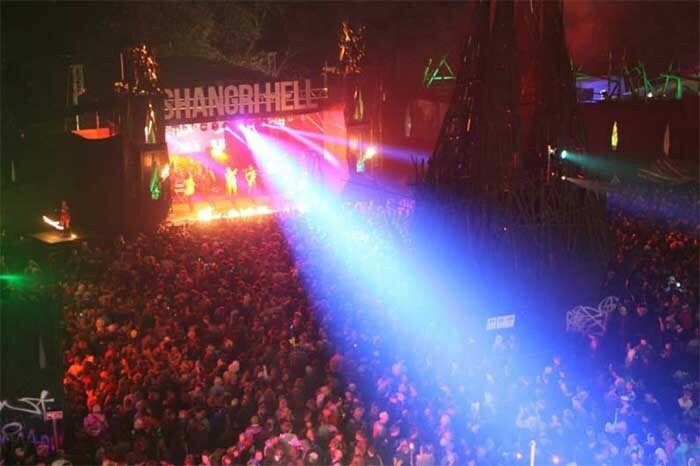 Every year the team comes up with a new concept, which is usually as eccentric as some of the people seen working there, and this year the theme was Shangri Hell. An industrial feast for the eyes, the constructions were so intricate and yet bonkers that it seemed a world away from the chilled tranquillity of the main stages or viewing fields. This year Richard Martin Lighting (RML) supported PF Events who have been involved in the festival for years. Providing Sharpys and Mac 600 Washes helped create a punchy and edgy look to go with the feel of the area. The bright colours and strong beams looked perfect and set the scene for some amazing live performances and DJ sets.